New York Giants’ victory Monday night gives Raiders the inside track so far at 1-8 to claim No. 1 NFL draft pick. ALAMEDA, Calif. — A sure sign a season went astray is when, in mid-November, the conversation is not about postseason contention or home-field advantage but where in the top five the franchise could select in the forthcoming draft. The Raiders find themselves in this position. All things considered, it’s looking good. The club would possess the No. 1 overall draft pick on April 25 if the regular season ended today. It improved from the No. 2 position on Monday when the New York Giants (2-7) defeated the San Francisco 49ers (2-8). The Raiders carry a 1-8 record into Sunday’s game at the Arizona Cardinals. Oakland has a fairly daunting schedule moving forward. Two of the seven games are against the Kansas City Chiefs (9-1), although it’s possible some Chiefs starters may be rested in the Dec. 30 season finale . The Pittsburgh Steelers (6-2-1) await in Week 14. No remaining opponent has a worse current record than Arizona (2-7). 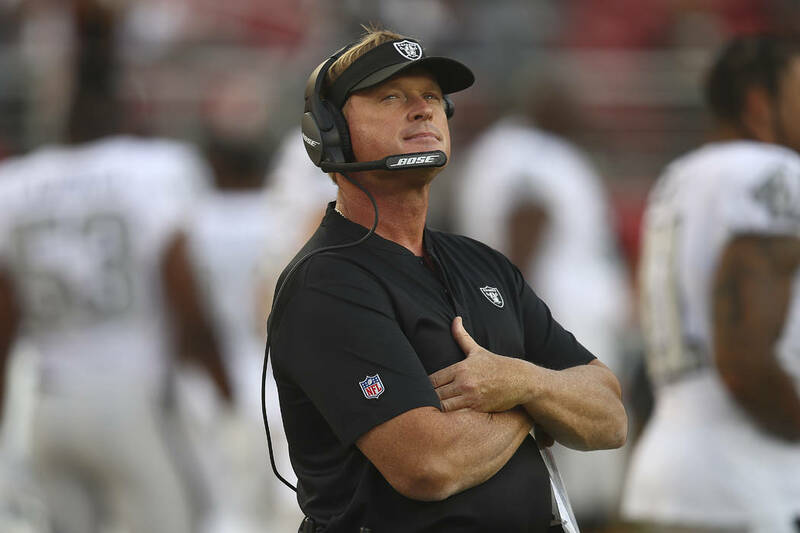 The Raiders have two other first-round picks, which they acquired when trading defensive end Khalil Mack to the Chicago Bears (6-3) and wide receiver Amari Cooper to the Dallas Cowboys (4-5). Both teams won Sunday. The Cowboys’ pick is currently slotted at No. 13 overall. The Bears are on pace to make the playoffs, a scenario that’d place the selection anywhere between No. 21 and 32. * Raiders broadcaster Brent Musburger apologized “if you were offended” during Sunday’s game broadcast for a tweet he sent last week, according to ESPN. In it, Musburger commented on an image of President Donald Trump speaking at a rally, quipping that several men in the background wearing Native American head dresses were U.S. Sen. Elizabeth Warren’s “relatives.” Warren has said part of her heritage includes being Native American. Musburger reportedly added in reference to the tweet: “I was just having fun.” A team spokesman declined comment Tuesday. * Defensive end Kony Ealy was waived Tuesday. Initially signed last week, he was a healthy scratch in his lone game with the team. More Raiders: Follow all of our Raiders coverage online at reviewjournal.com/Raiders and @NFLinVegas on Twitter. Contact reporter Michael Gehlken at mgehlken@reviewjournal.com. Follow @GehlkenNFL on Twitter.